Most of my needle felted creations are completely safe, but a few have bead eyes and decorative items. My new sheep is a ram named Shaggy, for obvious reasons! He has a wooden armature, covered with lots and lots of Masham curls. He is a very handsome ram. His horns are made from twisted string and his eyes are black glass. His fac and legs are covered in fleece. Shaggy Sheep measures 18cm. from nose to rear end! ​Please email Penny at: pennypaul@hotmail.co.uk if you would like to adopt him. 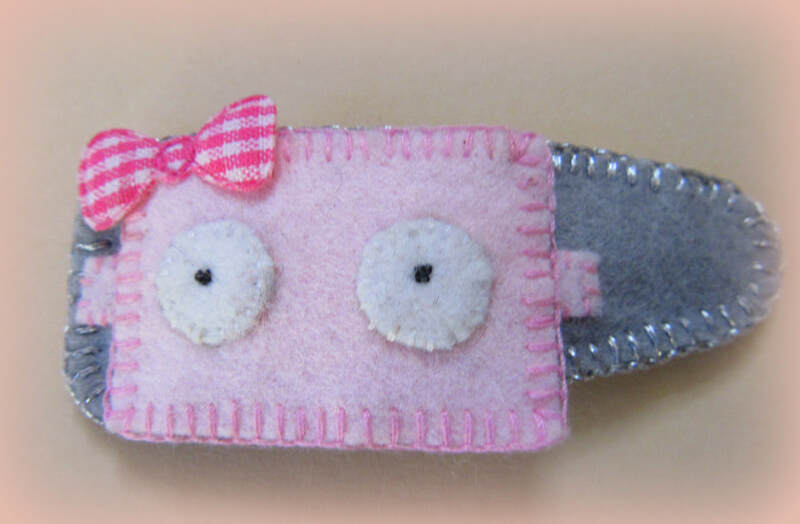 I am very pleased to be offering hand crafted items from Fabric Farm. All the felt used is wool felt. Please see individual items for prices. ​Needle felted Santa and felt house. 15cm in total. Five fun needle felted strawberries, each 15mm wide. They have pressed felt sepals and a felt stalk, plus little painted on seeds. Free postage to U.K. Please contact me for overseas prices. Mr and Mrs Sheep both have knitted bodies, which have been needle felted with lots of lovely curls. Mr Sheep is a Hebridean ram and his missus is a Masham ewe. They both have needle felted faces and black glass eyes, plus embroidered features. Mr Sheep's horns and both their legs are felt. Mr and Mrs Sheep stand 11cm and 10cm respectively. Available to buy as cards, cushion covers etc. Gniddle has an extra specially soft, full and luxurious beard of curly Teeswater fleece. His nose and cheeks are made from fleece. His hat and body are made from a fairisle style wool. He measures approximately 34cms. from the tip of his hat to the tip of his toes. Flowerpot not included. This little gnome is made from red felt and heavily weighted with clean steel punchings. Xmas Gnome has an extra specially curly and luxurious beard of Teeswater curls. Xmas Gnome has a Merino wool nose, which has been slightly shaded. Christmas Gnome measures 18cms. from his bum to the top of his hat. Gneville has an extra specially soft, full and luxurious beard of curly Teeswater fleece. His hat and body are made from jute, fleece and wool. ​to the curl of his hat. Gnathaniel has an extra specially curly and luxurious beard of random hand dyed Masham curls. His hat and body are made from jute, wool and hand-dyed fleece, kindly donated by a sheep named Barbara, who comes from a field in Bradford. The trim on his hat is fluffy white wool and he has sparkly pom poms at the end of his gnome hat. He measures 26cms. to the curl of his hat. Gnoog has an extra specially soft, full and luxurious beard of undyed Masham curls. His hat and body are made from jute and wool. The trim on Gnoog​'s hat is fuzzy white wool and he is wearing his specs on his nose. Lastly, Gnoog has a real dried acorn at the end of his hat. He measures approximately 30cms. to the curl of his hat, but is a little smaller than my regular gnomes. Penguin Graduate is a stocky little needle felted fellow made from Merino fleece. His hat, scarf and feet are also handmade in felt and fabric, with a silk tassle. He is wearing handmade wire spectacles. Three handmade felt pumpkins, filled with polyfibre and finished with strong thread. Hand dyed fleece from Masham Sheep is used for the tendrils.